The runes IKUARI, or Ingvar, on runestone Sö 281. Abstract: The history of Sweden was not a priority subject for saga writers in Iceland. 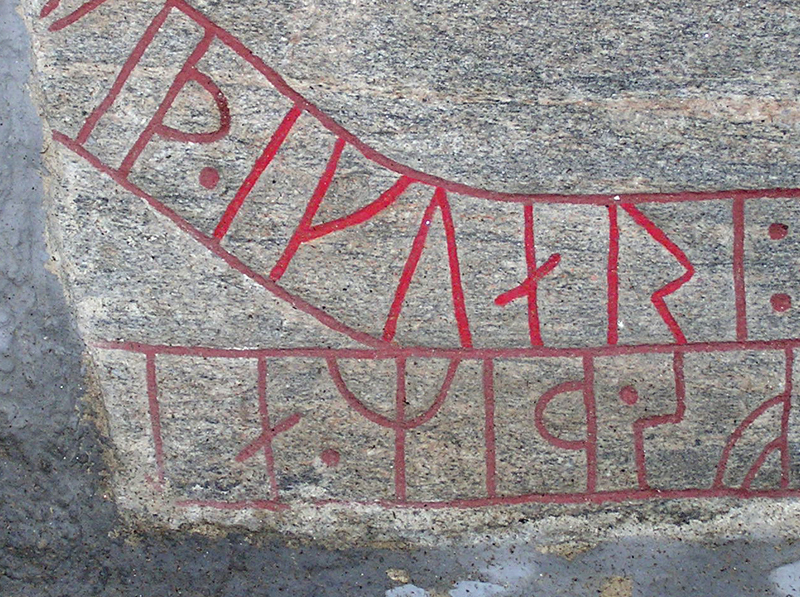 The “Saga of Ingvar the Far-Traveller” (YS) is based on a reliable fact, justified by about 25 runic inscriptions which date to the first half of the eleventh century, that a military expedition, led by Ingvar, went from Sweden to Eastern Europe, then moved to the South or to the South-West and perished there. The plot was revived by an Icelandic cleric who compiled the YS. His special interest towards the episode of the history of Sweden might have been provoked by the fact that at his time (beginning in the end of the twelfth century and through the thirteenth century) Sweden was active in pursuing its own missionary activity in the East Baltic region. The author of the YS constructed his saga on the principles typical of Icelandic fornaldarsögur, relating a story of a journey to a marvelous world. The plot itself provided the author of the saga with vast opportunities for the development and together with other features it was supplied with episodes and descriptions similar to those which are found in abundance in Latin Chronicles of the Crusades and other sources. The basic opposition of the chronicles between the Christians and the Muslims is presented in the YS as the opposition between the Christian Scandinavians and the pagans. Thus the historical fact of a real expedition of the Swedes to the East got a new interpretation: the story of Ingvar became a “missionary” (as Hermann Pálsson and Paul Edwards called it) saga. Introduction: It is a rare and happy event in the early history of Sweden, which is otherwise not well documented, that the expedition led by Yngvar was recorded in two different types of medieval source. About twenty-five rune-stones, located in Central Sweden close to Lake Mälar, were erected in the mid-eleventh century to commemorate the deceased participants in the expedition, one of the last Viking Age expeditions to the east. Short, formulaic phrases carved on the stones name more than 20 warriors who went with Yngvar. That these stones are so numerous testifies that it was a large-scale and well-organized venture. Yngvars saga víðförla, written in Iceland about a century and half after the stones were raised, is largely devoted to a voyage which Yngvar Akason, a Swedish nobleman, undertook with a fleet of 30 fully manned ships. The saga does not abound in details. Not many of those who took part are named, only Yngvar’s closest companions. The place-names mentioned in the saga are not sufficient to give an indication of Yngvar’s exact route, but it is certain that he came to Rus’ and left it after three years. We do not know his final destination. The chronology of the event, on the other hand, is well documented: the date of the hero’s death mentioned in the text (1041 in AM 343 a 4to, 1040 in GKS 2845 4to) leads one to the conclusion that Yngvar’s expedition started from Sweden in the late 1030s. The dating of the saga correlates with that suggested by the rune-stones.